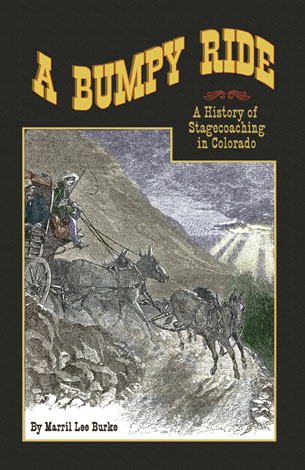 By the late 1860s stagecoaches were a new and exciting way to travel in Colorado. Hardly a Colorado town or mining camp could be found where stagecoach wheels had not left their tracks. The Colorado stagecoach was a thing of beauty, but it carried not only a large load of passengers but mail and express packages over some of the toughest roads in the country. Colorado stages often needed the addition of another pair of animals and because of the many dangers, the miles traveled in any specified length of time had to be greatly revised downward. In the winter wheels were often exchanged for runners so that the coach could travel through the deep Colorado snow. We can only imagine what it was realy like to traavel hundreds of miles in a swaying stagecoach with hard, wooden benches for seats, often having only a mere fifteen inches of space to yourself. Stage passengers often encountered rainstorms, wind, thunder and lightning, mud, snow and rockslides, all with only a thin piece of canvas to protect them from the inclement weather. But this was the premier way to travel. Passengers often overlooked the hardships and only remembered the speed, the beauty, and the excitement of a Colorado stagecoach trip.